TOHA awarded its first W. Stewart Caffey Award for Excellence for Precollegiate Teaching to Lincoln King, longtime educator at Gary High School and creator/sponsor of Loblolly magazine. Caffey himself nominated King, stating, "I believe he is the quintessential example of an individual who teaches his students the value of history and the importance of preserving it. Then together they do so." Learn more about Loblolly. 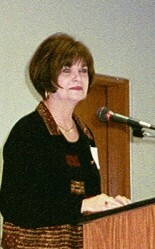 On February 15, 2002, at Panola College in Carthage, TOHA President JoAnn Stiles presented TOHA's first W. Stewart Caffey Award for Excellence for Precollegiate Teaching to Lincoln King. The Panola County judge had declared it Lincoln King Day, reporters from Longview and Dallas were present and took notes for articles, and former students, current Loblolly staffers, and interviewees spoke of King’s significant work in their community. In an impressive display of energy, Stewart Caffey and his wife drove halfway across Texas from Abilene just to attend the ceremony and luncheon, which was lovingly arranged by Ann Morris and her helpers at Panola College. Bobby and Myrna Johnson and Tom Nall and his wife drove up from Nacogdoches, and the event was a great success. Bryan Wooley featured King in “How Mr. King became a teacher for the ages” (Dallas Morning News, February 23, 2002). 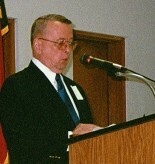 Wooley explained that at Gary High School, with its 130 students, King was “the entire history department.” He taught American history for both eighth and tenth grades and also taught Texas history and world history, government, economics, and geography. In May 2001, I completed my thirtieth and final year as teacher at Gary High School. Little did I think when growing up in Maine that life would begin at forty in a small, rural community in faraway Texas. In the summer of 1971, I was in Dallas with my wife, Mary Nell, and our three sons. I was hunting for a teaching job in the eastern half of Texas, and I discovered an opening for a history teacher existed in Gary. Upon looking at a Texas map, I couldn't find Gary anywhere. Mary Nell’s grandmother told me, “I know where Gary is. Poppa and I taught there in 1903.” I discovered they had been the total teaching staff. He taught the big ones and she taught the little ones. The rest, as they say, is history. In my second year at Gary, I had an outstanding group of freshmen. We spent the fall semester trudging through a geography course. At Christmas, my wife received a copy of The Foxfire Book, published by a class of Georgia high school students and their teacher, Eliot Wigginton. The book consisted of interviews with older members of the community as a means of telling the history and culture of the area. The concept was based on the idea that learning could take place outside the classroom. I figured that Texas students were as smart as any others and could do the same thing here. I returned to school in January 1973 and we got started on a project ourselves. The students were glad to escape geography and were off with tape recorder and camera to visit the first of hundreds of those to be interviewed and to become part of the Loblolly story of Gary and Panola County. The generation gap disappeared and old and young learned to understand and appreciate each other. The Loblolly has been a most successful project for the young people of Gary. They have learned much of their history and culture. They have learned how to run a successful business as they do not depend on the school for financial support. They have gained confidence in themselves by speaking at state conferences and on television. A key to Loblolly’s continuity has been the peer teaching where older students train younger ones on interviewing, computer skills, marketing expertise, and communications. Over the first twenty-eight years, Gary students have published sixty-one issues of the Loblolly magazine and six books. In the process they have done much to preserve the history and culture of East Texas. Article topics have ranged from quilt making and churning butter to baseball, to World War II, to Tex Ritter, and on to our best seller, the exploits of Bonnie and Clyde. The students made these twenty-eight years of Loblolly a wonderful adventure for me. Hundreds of students at all levels and capabilities have been part of the project and have been my friends. The excellence of their work has brought them state and national recognition, ranging from articles in the Houston Post to the New York Times. That was pretty heady stuff for all of us. The exciting thing for me has been realizing that such excellence can be the product of such a small school. I want to thank all those who were with me. We could never have done it without Stanley Yarborough, our principal and superintendent for over twenty-three years. I also thank my wife, Mary Nell, for her patience and understanding. Most of all, my deep gratitude goes to the students of Gary who have put up with me for so long. I am delighted that the Loblolly continues at Gary. An issue appeared in the fall. Interviews have been done which will appear in the next issue this spring. Older students are training new staff members in the many skills required to produce a Loblolly publication, and a new advisor, Valerie Blair, has been found to carry on the project which put Gary on the map. Valerie was the second student editor back in 1974, so she is well prepared for the job. Finally, I want to thank TOHA, Stewart Caffey, Ann Morris, and Panola College for a great surprise and honor for all of us at Loblolly.